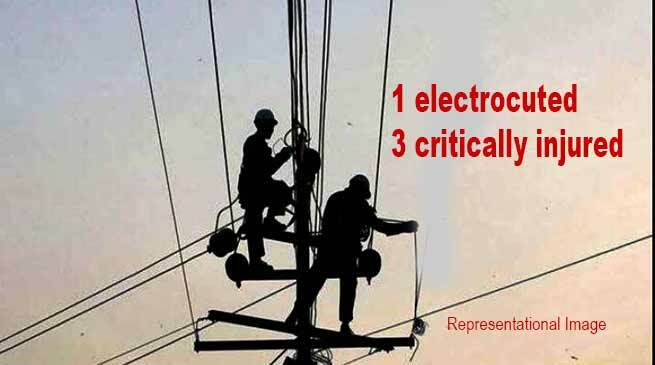 1 person electrocuted while three workers critically injured when they were working for laying of cable works, and Mobile tower in Lichi area of Kimin Circle today. Kimin Sub-division Officer (SDO) Likha Tejji inform that as per information the locals were working for a contractor for laying of cable line of JIO mobile network and the incident was held during the morning today at around 9.30 AM. They were erecting a post, during their work which touched the High tension wire which was passing through there and all most all were electrocuted in which one died on spot while three of them were evacuated and admitted here at Tamo Riba Institute of Health & Medical Science (TRIHMS) in critical condition. Tejji said that the deceased have been identified as Taba Tebin, 43 years a resident of Lichi Village, while the critically injured person are HIba Tapin, 22 years, Taba Tara, 20 years who is son of deceased, Tarh Borbin, 22 years. SDO informed that he have directed the offer incharge of Kimin to immediately enquire into the matter and submit the report. Minister Land Management and Forest Minister and local MLA Nabam Rebia while talking to Arunachal24 said that it is a sad moment and is visiting the place tomorrow with the officers and magistrate and assess the situation and also meet the victim family member and later visit to victims at hospital and will see what help is being extended to them. He said that the ex-gratia as per rule will be paid to the family members of the victim.